look water resistant and long lasting Suitable for A4 size prints. 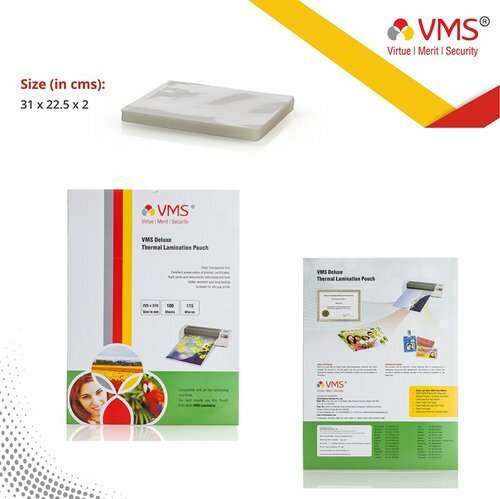 Compatible with all hot laminating machines. Our company which started a trading business in Graphic Art products in 1988 has since become a fast growing ISO 9001:2008 certified company dealing in high quality Healthcare Imaging, Accessories and Equipments and Photographic products. In keeping with the emerging growth trend, the change to our new logo VMS strengthens our existing principals in Virtue, Merit and Security by extending this to practice ethical business, pro-activeness and creating trust in our endeavors. “With our registered office in Raipur, our corporate office in Mumbai, a strong network of branch offices in all major metros and cities of India, the state-of-the-art and ISO 9001:2008 certified confectioning facility at Dadra, the well equipped manufacturing unit for Hospital Furniture at Umbergaon and the introduction of our own VMS branded products, we are poised for a progressive commitment and growth not only for our company but also for our Principals, Business Associates and Customers."